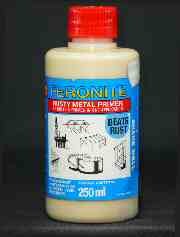 Feronite Rusty Metal Primer 250ml : Boatcraft Pacific, the home of wooden boat building. Feronite Rusty Metal Primer combines Feronite Rust Converter with a polymer primer moisture barrier. Unlike other rust converters and so called converter primers, Feronite is considerably less acidic and so will not do nearly as much further damage to any remaining galvanising. Feronite Rusty Metal Primer is a true polymer primer which incorporates a rust inhibitor and is combined with a rust converter which is unlike many other so called converter primers which are little more than a dilute acid solution. It can be over coated as soon as it is dry, 3 to 4 hours, or the primer will remain stable for many months before final painting is needed. The only preparation required is degreasing plus light wire brushing to remove loose scale, flaking rust or unsound paint layers. It is best applied to a damp surface. Since Feronite Rusty Metal primer is also a primer, final finishing then only requires a top coat. Ideal for deteriorating iron roofs and rusting boat trailers, this product can extend their lives for many years. In recent time, large quantities have been used as part of a professional protection system on offshore oil rigs. This product has a shelf life of 12 months from the date of manufacture and should be used within that period. It is used for the treatment and preparation of rusted steel or galvanised surfaces on steel structures of all kinds including building frames, roofs and guttering, sheds, balustrades, bridgework, car bodies and trailers. 50mm Solvent resistant marine brush.